Description: Sriracha Chili Sauce Powder is made from Sriracha Chili Sauce converted to a free flowing powder, yielding maximum Sriracha Sauce flavor, color, heat and aroma to a variety of food products. Use to the flavor intensity desired. Can be used in coatings, glazes, blends, dry mixes, sauces, etc. Usage: Use in making rubs and spice blends by adding to the flavor intensity desired. 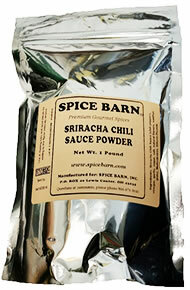 Ingredients: Sriracha Chili Sauce (chili peppers, vinegar, garlic, sugar, salt, natural flavors, xanthan gum), Maltodextrin, Silicon Dioxide.